It was so close...the semi's were within reach; but up against an incredibly tough #2 seed opponent, the Indian duo of Chinappa & Pallikal, Canada's Cornett & Todd failed to reach the semi-finals of the 2017 WSF World Doubles Championship [click here for QF match score]. The Canadian duo played well, and have been playing well all championship - they have faced the top two seeds of the championship and taken both matches to the third and deciding game. Cornett & Todd have found their 2015 Pan Am Games silver medal groove and will no doubt play hard until the end! The duo now starts their fight for fifth - a fight they are one step closer to achieving as confirmation of the Malaysian duo withdrawing has come, resulting in a bye for the Canadians. They now wait to see who they will face in the 5th place match up, scheduled for Saturday August 5th at 12pm local (7am EST). In addition to the Women's pair, Canada remains in the hunt for strong finishes in the men's and mixed divisions as well. Action continues (bright and early for those watching at home from Canada) with all four squad members on court tomorrow. July 1, 2017 - Starting tomorrow (Tuesday August 1st), the Canadian squad will hit the doubles courts of the National Squash Centre in Manchester, England for five days of International competition. From August 1st to the 5th, doubles pairings from around the globe will battle it out at the 2017 WSF World Doubles Championships. Ahead of the start of the championships the duos in all three events were seeded, providing the four Canadian athletes traveling to Manchester a look at the competition they will face across the pond. In the Men’s division, Canada’s representatives David Baillargeon & Shawn De Lierre are seeded 13/16 in Pool D, along with competition from New Zealand, England, and Norway. The two Quebec products may surprise some, as they combine international experience and success of Delierre with a budding Baillargeon, as he breaks onto the world scene in his first ever World Championship appearance. The pair play out of the same Montreal club and will look to put that chemistry on display come tournament time. In the Women’s division, the 2015 Pan Am silver medalist pairing of Samantha Cornett & Nikki Todd are in the thick of Pool A, holding the eighth overall seed. There will be stiff competition from top-seeded New Zealand, and the ninth-seeded Dutch pairing, but with valuable playing experience together, two of the nation’s best are poised to contend. In mixed action, the pair of Samantha Cornett & Shawn De Lierre received the tenth-seed and will battle out of Pool B against pairs from India, Wales, Malaysia, and the Netherlands. Nikki Todd & David Baillargeon find themselves seeded 13/16 within Pool D, where they will go up against Australia, England, the Netherlands, and Colombia. The members of the Canadian squad will first hit the courts at the National Squash Centre in the mixed pairs events. 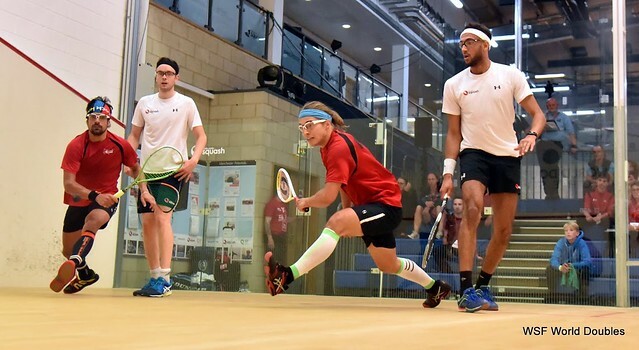 Cornett and De Lierre, who face Malaysia’s Arnold and Mohammed at 1:15pm local (8:15am EST) on day 1, while Todd and Baillargeon take to the court at 2:30pm local (9:30am EST) against Grinham and Schweertman of the Netherlands. Later that day, the men’s pair and women’s pair then get their first taste of their opponents. Baillargeon and De Lierre will first face England’s James and Willstrop Tuesday evening at 6pm local (1pm EST). At the exact same time, 3 courts down, Cornett and Todd take on King and Landers-Murphy of New Zealand.